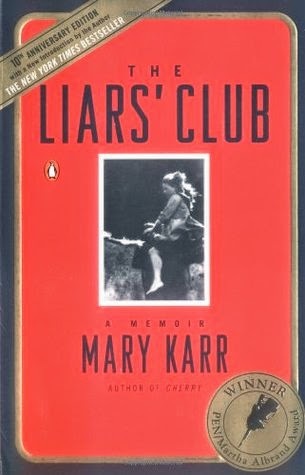 When it was published in 1995, Mary Karr's The Liars Club took the world by storm and raised the art of the memoir to an entirely new level, as well as bringing about a dramatic revival of the form. Karr's comic childhood in an east Texas oil town brings us characters as darkly hilarious as any of J. D. Salinger's—a hard-drinking daddy, a sister who can talk down the sheriff at twelve, and an oft-married mother whose accumulated secrets threaten to destroy them all. Now with a new introduction that discusses her memoir's impact on her family, this unsentimental and profoundly moving account of an apocalyptic childhood is as "funny, lively, and un-put-downable" (USA Today) today as it ever was. After reading Will's intriguing review of Lit: A Memoir, I decided it was time to explore Mary Karr’s work, so I went to the library and borrowed The Liars' Club. Written in 1995, this memoir explores the author’s dysfunctional childhood in sweltering and swampy Leechfield, Texas. Though Mary Karr and I did not have similar childhoods, there were definitely certain life situations and reactions to them that I could relate to and I came to realize that no matter how different people’s lives are, there are always things that will connect us. I was enthralled by her writing, which is very intimate and lyrical and enabled me to empathize with her. Just like my dad, Mary’s dad saved receipts from nearly every bill he paid (and he always voted Democrat). My brother was an obedient child and always stayed still while my dad was smacking him. To me, that made no sense and just made it easy for my dad. If I put enough energy into evading and escaping, dad had to spend energy grabbing for my wrist or bending over to yank me out from under the bed. This did not exhaust him, as I hoped it would, but only made the beating worse when he finally got a hold of me. So Mary’s parents weren’t so great, but I loved the details she used to bring them to life. Even with all their flaws, I found it difficult to dislike them totally. My parents weren’t so perfect either. For the most part I was able to get past that when I remind myself they are human beings with flaws, and children don’t come with an instruction manual, and people just do the best they can. It’s not always good enough, but it’s easier to understand and empathize with your flawed parents when you’re not putting them up on a pedestal attributing superhuman qualities to them. This is a very worthwhile story about hardship, family relationships, survival, and growing up. It is absorbing, disturbing, hilarious, honest and difficult to put down. I am looking forward to reading about Mary’s teen years.